I have a friend. Honestly, I do. He is a former colleague but I can prove he is also a friend because Facebook says so. He is a quietly spoken, kind, clever and thoughtful guy. He also owns a gun shop. It is a good gun shop. It is the type of gun shop that sells really sleek looking hand guns and rifles to smart looking people who want to be prepared for a home invasion or hunting season or the apocalypse or perhaps who just like guns. He does not live in the UK. Once we, as in me and my friend and a couple of other former colleagues who did not end up as my friends, were hanging about waiting for a briefing on something ever so important. I can’t remember what it was. I can remember what we talked about. There was the “guilty pleasure food” we would head for when we got home. I won’t share what mine was for fear of being mocked by my colleagues, but the clue is that they are made in vast quantities in Callington. And with less automation across the rest of Cornwall. Then my friend asked whether I knew the story of the “Cornish 9 / 11 Hero”. I didn’t. His name is Rick Rescorla. It’s an inspiring story if you get the time to look it up. I am pretty sure it was after 9 / 11 my friend’s gun shop started. We don’t have gun shops in the UK of the type my friend had and still has. But more and more recently we do see coppers out on the streets with guns, which is a change. Firearms have become a more common sight in the UK. I don’t think most of us are used to the sight. Two armed officers, both of whom I’d served with as a Constable on patrol, turned up our office on Tuesday. They had just finished dealing with and recording a domestic incident, and had dropped into the nick to grab a cuppa and use the porcelain facilities before resuming patrol. I wasn’t used to seeing them with guns and it felt a little strange to think these were the guys I used to stand beside at the occasional “confrontational” situation. I was interested to see how the community reacted to them and what they would say to the great British Public if they could. The first officer went for an explanation about what to do if see an emergency vehicle with its blue lights and sirens operating whilst driving. That should really get its own blog. So it will. The second officer thought it would be a good thing to explain it is ok to have random people come up to unarmed and armed officers to say hi, have a chat. He explained that a man had approached them when they were patrolling a town centre. He had clocked[i] the fellow walking towards him and automatically made his assessment. This member of the public coming towards him smiled and looked a little embarrassed. The officer prepared himself for one of the “Public Information” questions that are so common. How do I get to such and such? What bus do I need to catch to get to? My neighbour has done this and what will the police do about it? That type of thing. What actually happened was that this fellow walked up to officer and said “I just wanted to say thank you. Thank you for everything you do to keep us safe”. It took the officer a while to figure out how to respond. In the end he settled for “You’re welcome”. The fellow then left, looking a bit less embarrassed. The officer had a brief whispered conversation with his colleague to decide if the man had been taking the mickey, or was being genuine. The officer describing the events to me made a point of saying the whole experience left him feeling a little stunned. In the end they decided the man seemed genuine. This was the first time anyone had said anything like that to either officer. In the years they had been a police officer no stranger, no run of mill member of the community had approached them for no discernible reason other than simply to say thank you. The armed officer has served for nearly 15 years. The second officer has served for 13 years. And apparently the act of saying thank you is spreading. Our deputy Chief Constable is at Glastonbury. He has just tweeted “Can’t move anywhere without people shaking our hands. Great public support for the police”. I have to admit I feel a little “stunned” myself. What with guns being seen strapped to police officers on the streets, referenda, elections, wicked people doing horrid things, tragedies and outpourings of love life can already feel a bit overwhelming. Add to that a very real, positive and noticeable change in the way people relate to and behave towards the police family and I think it’s understandable that some of us are not quite sure how to respond. “You’re welcome” seems a little inadequate. 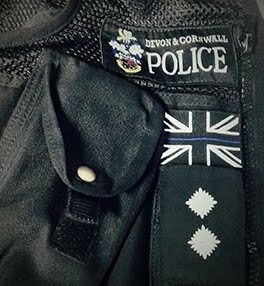 So I just wanted to say that if anyone feels a new sense of gratitude or respect for the police family it is good to let us know. Any letter, email or conversation you have that lets us know you care is a good thing. Your kindness and support is appreciated, immensely. But it may take the street tempered and world weary members of the police family a little while to become used to having nice things said to them whilst out in the public eye. I’d ask that you be patient with us. It is a pretty new thing for us and we have yet to work out a better reply than “You’re welcome”. Oh, and to everyone who is in the ambulance, fire and rescue and police families in whatever role, you are awesome. PS – please drive safely, be kind to each other and don’t mess with other people’s stuff. [i] “Clock”: to see, to notice, to have your attention drawn to. As in “I clocked the bloke who had been on briefing”. Old Bill Slang – none existent publications.